We assessed the psychological trait of hope as an explanatory mediator in the relationship between the home environment and sexual risk behaviors among 2533 young women in rural South Africa. Hope mediated the relationship between average household age and sexual debut (mediated effect = − 0.003, p < 0.05), and between household consumption and sexual debut (mediated effect = − 0.019, p < 0.05). Both higher average household age (β = 0.01; 95% CI 0.00, 0.01) and greater household consumption (β = 0.05; 95% CI 0.02, 0.08) were marginally associated with higher hope. 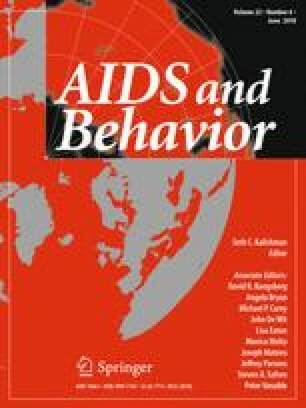 In turn, greater hope was associated with lower odds of sexual debut (aOR = 0.62; 95% CI 0.52, 0.74). These results provide important preliminary evidence of the role of the home environment in shaping protective psychological assets and healthy sexual behaviors. Continued exploration of the relationship between hope and the home environment may help to explain why young women in this context have a disproportionate risk for HIV. This work was supported by Award Numbers UM1 AI068619 (HPTN Leadership and Operations Center), UM1AI068617 (HPTN Statistical and Data Management Center), UM1AI068613 (HPTN Laboratory Center), and T32AI007001 from the National Institute of Allergy and Infectious Diseases, the National Institute of Mental Health and the National Institute on Drug Abuse of the National Institutes of Health. The content is solely the responsibility of the authors and does not necessarily represent the official views of the National Institutes of Health.